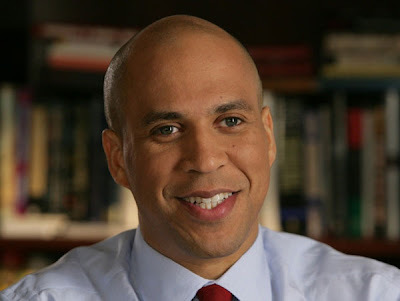 Brother Jesse Blog: Newark Mayor Cory Booker saves neighbor from a burning house and calls it a "Come to Jesus Moment." Newark Mayor Cory Booker saves neighbor from a burning house and calls it a "Come to Jesus Moment." No this is not an episode of Superman or a clip from the cartoon movie "The Incredibles." On the night of April 12, Newark Mayor Cory Booker, whom I've already considered a true public servant, added yet another extraordinary act to his list. He told CBS News that he arrived home last night to find that his neighbor's house was burning. He rushed in, surrounded by flames, and saved the woman who was trapped inside. Mayor Booker suffered second-degree burns and smoke inhalation. The woman, whom he threw over his shoulder and got to safety, suffered second-degree burns on her back. Wow! Check out these tweets Mayor Booker posted about it. A big salute to you sir!